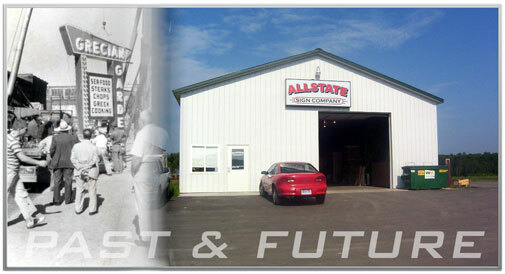 From PAST TO PRESENT is a special phrase to us --- Allstate Sign Company was formed in the 1960’s by Bob Denoyer, father of present owner, Mike Denoyer. Mike worked along side his father from the age of 8 and officially became an employee at the age of 18. In the late 70’s Allstate Sign Company was sold, however, the name did not go with it. Again, Mike worked for the new company as their installer. In 1983 the sign industry in Metro-Detroit would again hear the name Allstate Sign Company when Mike became the proud owner. In 2002, Allstate Sign Company relocated to Clare MI to service the Northern regions of Lower Michigan. Mike is licensed in the state of Michigan as a Sign Specialist and Sign Contractor. Why do we mention this? Because a wealth of knowledge has been gathered from the experience Mike has gained over the last 40 years. Yes times have changed and sign installation and service have reached a new level, however the principles and ethics of our company have remained as they were in the “good ol’ days”. We strive for the highest level of customer service simply by listening and using our knowledge to best meet the needs of our customers. From our national accounts to our local business owners they get our full attention to detail. So whether you are an business or individual looking to promote your business, having the right sign is critical to its success. First impressions stick, so let us help you be remembered.